Probate can be so difficult and figuring out where to start can take a lot of energy! 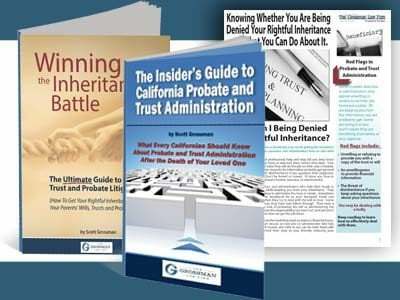 We understand that California probate laws require you to collect a lot of information and to be prepared to give that information over to an attorney to start probate properly is overwhelming at times. That is why we created this probate checklist to help you know what things to hold on to and put together so that when you get ready to start probate you have everything you need right there. A lot of people worry that they have not completed every single item in the probate checklist. Do not worry! This is because we try to cover everything that could possibly be in an estate. This does not mean that your loved one will have everything in the Probate Checklist. We understand that this is something that takes time to pull together and that it is often emotional for things you did not expect to be. 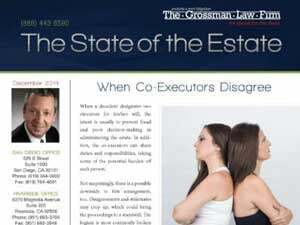 This is why we made this Probate Checklist readily available and easy to use. We want to make sure that you have as much help as possible and providing a way for you to know what to look for when dealing with things and preparing for Probate and even determining if you have to do probate for your loved one’s estate is important. Our Probate Checklist gives you a list you can check off and make sure that you are ready for all the questions you will be asked and you need to answer in advance and that can help you deal with this very stressful situation. Personal Property, Household Items, Vehicles ETC. This is not everything that will be asked but request a copy of our Preparing For Probate Checklist and you can be ready to answer the questions that an attorney will ask in helping you to open probate. 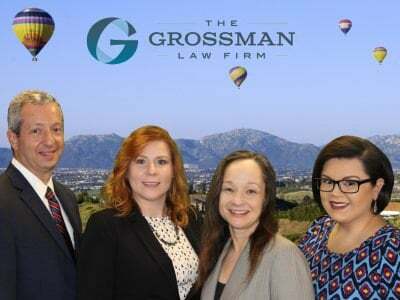 We believe that an educated client is the best kind of client and sharing this in advance of ever making an appointment to talk with one of our attorneys will help both us and you be better able to accomplish this often difficult task. 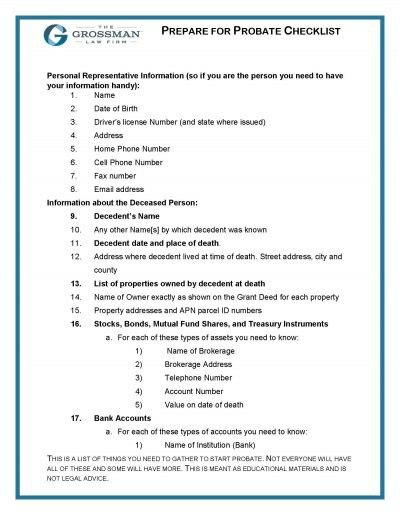 Use the form below to request your copy of the Preparing For Probate Checklist. Your first step should be to carefully read the Probate Checklist. This provides an overview of the things you need to have answers for, and if you take time and fill out this information then when you talk with an attorney it make your meeting much more efficient and allow you to complete a lot more of the tasks. It is very important that you consult with an experienced and reliable California probate attorney to make sure that you need to complete a probate and that you are doing everything correctly the first time. Contacting an attorney that is experienced in dealing with such matters gives you the opportunity to take care of things right the first time. We often hear from new clients that they tried to hire someone to help them that was not knowledgeable with the probate laws in California and how it cost them both time and money as well as heartache. We offer this Probate Checklist to help you be prepared and to help you realize if someone you are thinking of hiring is not asking you the right questions. To learn more about the probate process view our videos on Probate Notice and Executor’s Responsibilities in probate. Contact our office today to schedule your free 30-minute phone consultation with an experienced trust litigation attorney at (888) 443-6590.